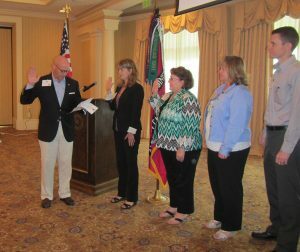 Atlanta, GA — Brian L. Dance, P.E., S.E., Project Director with Innovative Engineering, Inc., was sworn in as the 2014-16 Treasurer for the Society of American Military Engineers (SAME) Atlanta Post on June 10th at the Dunwoody Country Club. “I look forward to the many opportunities and professional and personal rewards of supporting the A/E/C industry and Military community through SAME,” adds Dance. As a NCEES licensed Structural Engineer in Illinois and licensed Professional Engineer in Georgia, Dance brings experience with multi-million dollar projects ranging from single story explosive ordinance and disposal (EOD) facilities and military hangars, to 14-story buildings. He received his Bachelors and Masters of Science in Civil Engineering from Brigham Young University, and Graduate Courses in Structural Engineering from Georgia Institute of Technology. Dance is also a member of the American Institute of Steel Construction (AISC), American Society of Civil Engineers (Member ASCE 7-16 Seismic Subcommittee), and the Structural Engineers Association of Georgia (SEAOG-Member of SE Licensing Committee).